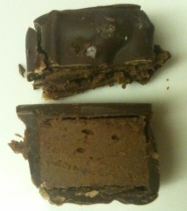 The chocolate that they use is all Valrhona so you know from the outset that it is going to be delicious. The box is actually deceptive. It was something that actually put me off at first but given the short shelf life I knew I had to tuck right in and get them eaten. Of course I then write this review on a different computer so you’re getting this slightly later than I had hoped but just imaging what an impression they had on me that I went looking for this review to share with friends to show them something to buy. Yes, ‘d buy these and I’d recommend a friend buy these. 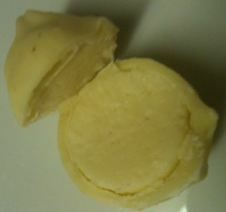 Dry Martini (white) – the excessively sweet white chocolate here slightly distracts from the centre that is so boozy, it might as well be liquid 😉 The shell isn’t too thick and the filling is just the most alcohol you could probably jam into a ganache without it just becoming vodka with a smattering of white chocolate. There seems to be a tuch of lemon zest in there to mimic the twist of lemon in a martini and the vermouth is pretty moderated as I’m not getting it as a distinct flavour. The aftertaste is absolutely vodka martini but wow… what a truffle. Could this work in a milk to lessen the sweetness a bit? I doubt it but it’d be nice a nettle less sweet. Margarita (square) – with a salted top, a bit of zingy citrus and a more solid ganache, this one has that tequila kick and distinctive flavour singing through the chocolate. 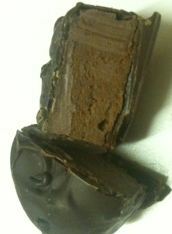 The chocolate itself might be slightly acidic which is catching my cheeks but the boozy truffle is absolutely gorgeous. Possibly not as runny (thank goodness) as the martini but truly what is as boozy as a martini? The flavour is gorgeously balanced and the tequila is a distinctive flavour note that comes straight through the chocolate. You know exactly what you’re eating when you scoff one of these babies. Trinidad Rum (round) – The rum is absolutely thew first thing you get in this. That rum cocktail flavour with that nose of something a bit citrusy, a bit like the zest of a lemon added to a mixer before liberally adding more rum than one person should drink. That just fires up your nose and absolutely makes you think ‘I’m having a rum cocktail’ straight away. That first boozy bite absolutely invokes that sense of a bar, with friends at the end of the week when you can just relax. Gorgeous and one you could eat far too many of! 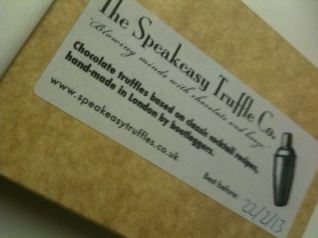 I have to admit, when I saw the truffles in their box I was a bit unsure. They had a really short shelf life (as all good chocolates do) and yet they were not the image of perfection I get at William Curley and Paul A Young. They are, however, delicious and absolutely what they say they are. I may not be keen on the packaging but I sure as heck am keen on the contents. I’d buy these but if you’d like to just VISIT THE SPEAKEASY COCKTAIL CHOCOLATE SITE.